This update is going to be an experiment in that I will be first giving an account of what has been updated in the galleries, as shown in the line of links at the top of the page, following this I will then talk a little about what I have been “up to” recently. 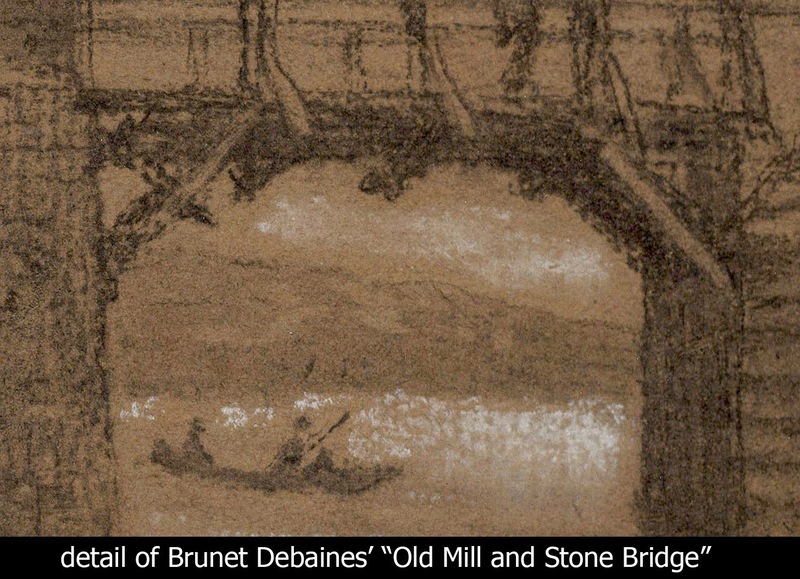 Let me begin with a truly superb chalk drawing, Old Mill and Stone Bridge, signed by the famous printmaker, Alfred-Louis Brunet-Debaines (1845–1945), featured in the “Architecture and Ornament” gallery. The subject—and I could be totally wrong with my attribution of the subject—has a passing resemblance to Le Vieux Moulin (the old mill) and bridge near Tourelles Castle (http://vernon-visite.org/pics/vernon2/tourellesmoulin/tourelles2.jpg [viewed 13 October 2014]), but a pencil note on the back of the drawing’s mount cites “Le Havre” (Rouen Normandie) so I will leave proper identification of the portrayed subject to those more familiar with historic sites in France. For me, this drawing exemplifies the skill and restraint of a great artist. Note for instance how the support sheet is allowed to breathe (in the sense that the paper is not covered completely with a layer of chalk) and, importantly, how the colour of the support sheet is employed as a mid-tone between the tonal extremes of the black and white chalk. To add a touch of the Orient to the “Figures and Fauna” gallery, I have listed two woodblock prints of cassowaries (a large emu-like bird that inhabits the rain-forests of North Queensland). The first of these prints is by Kono Bairei (1844–95). He is one of my favourite Japanese printmakers in terms of his ability to give life to his subjects, along with his very delicate choice of colours and his finely adjusted compositions (in the sense that the negative space surrounding the portrayed subject is just as important as the positive space occupied by the subject). 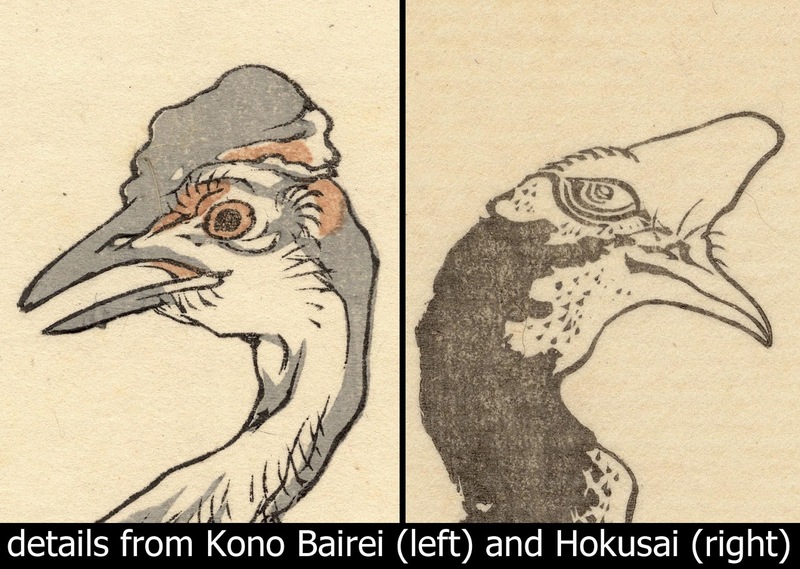 Viewers may be fascinated by the comparison of the living presence that Bairei is able to imbue his cassowary with the spirit that the second artist, the famous Katsushika Hokusai (1760–1849), is able to express with his image of a cassowary. In short, the two different images of cassowaries may be of significant interest to those with a sensitive eye to how different artists portray the same subject. Also added to the “Figures and Fauna” gallery is a graphically stunning image by Käthe Kollwitz (1867–1945) of peasants revolting. Beyond the emotionally moving subject depicted, what is especially interesting to me about this image is how Kollwitz focuses attention on certain details while giving only cursory information to “unimportant” elements in the scene. 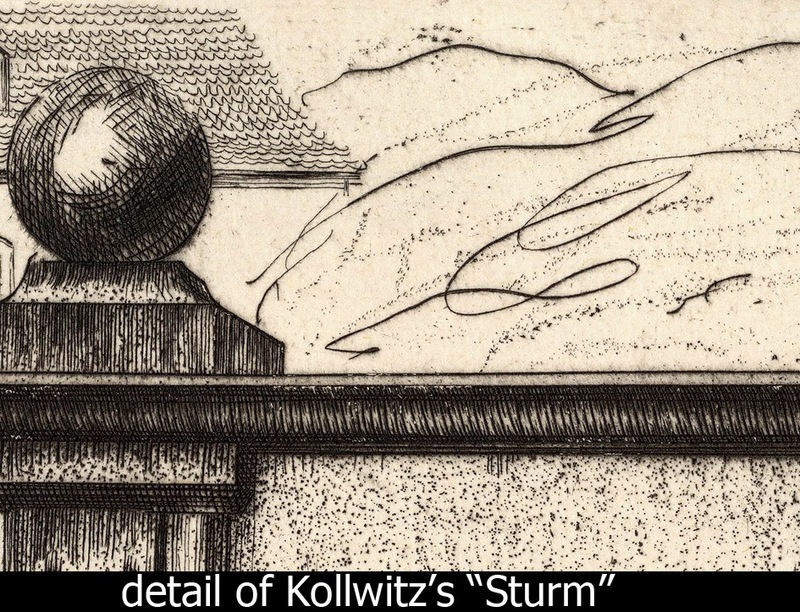 For instance, see in the detail shown below, how Kollwitz draws attention to the rendering of a stone ball capping a gatepost by the contrast of its treatment with the freely laid strokes loosely describing foliage behind the ball. In truth, there are so many noteworthy graphic incidents in this print that I found difficulty in narrowing my selection of only a few details to showcase in the gallery listing. In the “Landscape and Flora” gallery is a special treat: five prints from a suite of landscapes executed by Frederick Bloemaert (c.1614­–­­­c.1669/90) based on designs by his father, Abraham Bloemaert (1566­–­­­1651). Of special note in these strong and very distinctive prints is the way that human narratives are woven into the images. For example, Plate 13, features a woman drinking from a stream in the foreground while a goat is shown leaping across the crest of a hill in the distance. What makes this simple story so visually gripping is that the bounding goat is like a peripheral trace of movement in an otherwise still landscape despite the visually tumultuous arrangement of fallen logs, the flow of water and the action of the woman. If I allow my imagination to construct a larger narrative (i.e. one based on a personal concoction rather than privileged knowledge), there is also a link between Plate 13 and the plate, Rocky Landscape with Two Waterfalls, in that the advance of figures from the right gives a context for the fleeing goat (see details of the two prints below). 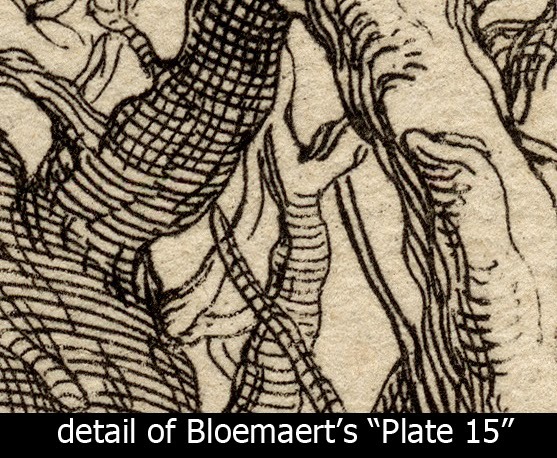 What I personally admire about the prints of the Bloemaerts is the way that their marks seem to physically “hold” space as may be seen in the detail below. 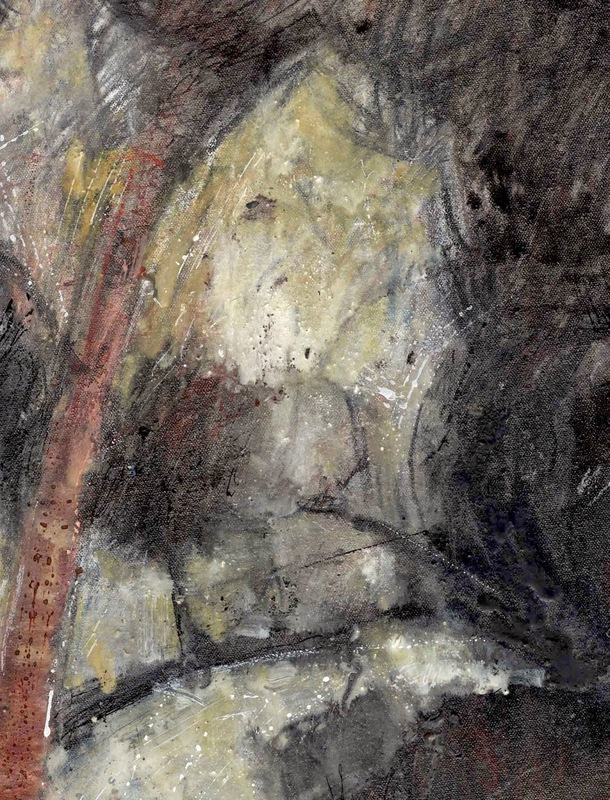 I mean this in the sense that the marks not only visually describe landscape features, but also present the features as if they are sensually handled. In the “Books” gallery I have listed a very rare first edition copy of the seventh volume in Sowerby’s famous illustrations for English Botany. All the 71 original engravings in this sumptuous volume have been delicately hand-coloured (as published). I have previously listed other individual Sowerby prints in the “Landscape and Flora” gallery but this is the first time that I have offered a complete volume of this rare and early publication. In the “Object and Artifacts” gallery I am listing a friend’s house for a very discerning buyer who seeks only the best in terms of location and luxury appointments. This is a house to dream about. 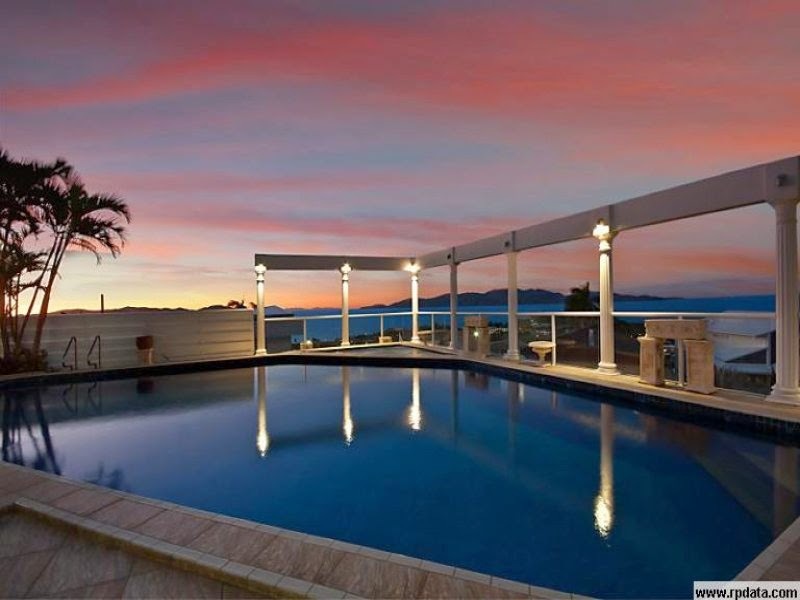 It is arguably the most prestigious house in Townsville, in the heart of peaceful tropical North Queensland, Australia. As a sample of what is on offer, see the poolside view below. Now that I have completed my update about the fresh items listed in the galleries, I thought that I might move to a completely different topic: what has been happening in my world. More specifically, how current pursuits have impacted on what I write about in the formal blog posts. Regarding the last instalment about subtle principles underpinning artists’ approaches to portraying vedute (i.e. scenic views), for instance, I now can see clearly how this focus for discussion began and I am now challenging myself to explain how it arose. Before I begin my explanation, however, I need to set a context in my art practice to give an insight into my present preoccupation. Essentially, what I “do” in art is to reflect the concerns and the interests of a contemporary local North Queenslander (for readers unfamiliar with where North Queensland is on the map, it is the “pointy bit” on the right side of Australia). These concerns should not suggest that I do not have an interest in what is happening in the rest of the world or what has happened in the past. Far from this being true, my concerns are defined by the rest of the world and by historical precedents. In fact, a large part of my art practice centres on reinterpreting early European rural scenes through the eyes of a person living in the tropics of Australia. This does not mean that I feature brightly coloured tropical birds and butterflies flapping gaily through a European landscape. This would be conceptually too obvious and even silly. Rather I make subtle changes to the principles underpinning many European landscape images to help me to identify and to understand personal differences of outlook. For instance, in my three artworks featured in the last post dealing with Piranesi’s prisons, the Carceri d'invenzione series, I was exploring the Western convention of lighting a subject from the top-front-left which is a convention very different to that used by Hebrew and Islamic artists who tend to use top-front-right lighting or Oriental artists who do not employ side lighting at all. Why this is interesting to me is that many local artists living in North Queensland tend to light their landscapes “incorrectly” according to the Western top-front-left lighting convention and light their landscapes from the right. For me, this is a very curious phenomenon. Moreover, rather than ignoring this propensity to light subjects from a different angle to the Western convention, I like to explore the anomaly in the angle of lighting that I believe typifies North Queensland artists. 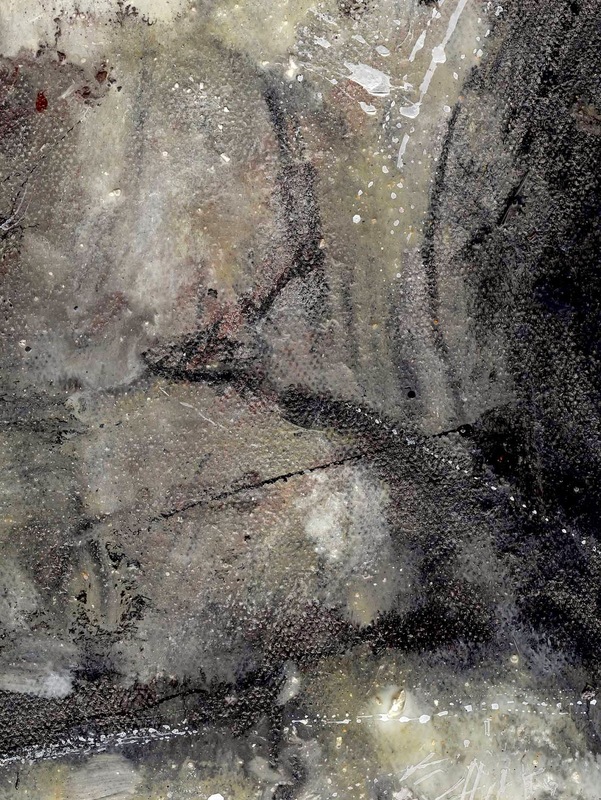 (see http://www.artchive.com/web_gallery/B/Benjamin-Duterrau/Conciliation.html [viewed 18 September 2014]). Here, the featured socially important subject is George Augustus Robinson offering hollow words of conciliation to the Tasmanian Aborigines who are later removed to Flinders Island and ultimately exterminated. (For more information about this shameful “conciliation” see Tim Bonyhady’s (2011) article: http://artsearch.nga.gov.au/Detail.cfm?IRN=64897&PICTAUS=TRUE [viewed 18 September 2014]). In this unapologetic aggrandisement of Robinson, note how he is spot lit with heavenly light from above while the Tasmanian Aborigines gathered around him are left in shadow. This arrangement of lighting is all about setting a political agenda and images such as this typify why I find some Western conventions, such as social spotlighting, so interesting to explore. Now that I have set the context for my reinterpretation of early images I will focus on my current explorations and how they excited my interest in writing about verdute. Shown below is a circular print, Plate 34, by Gabriel Perelle (1603–77) and/or by his sons, Adam (1640–95) and Nicolas Perelle (1631–95). 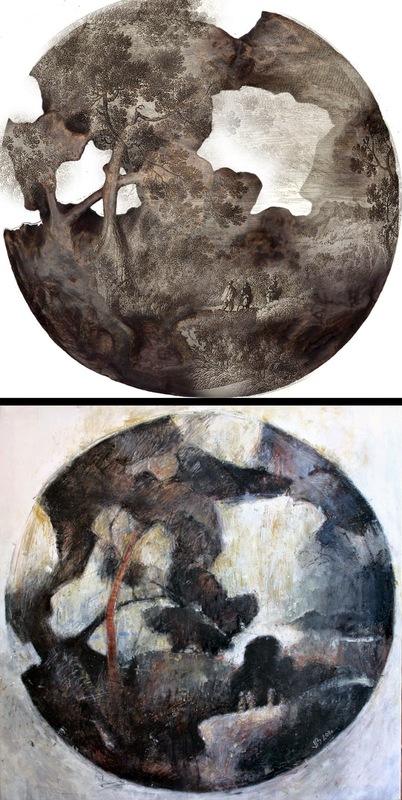 This somewhat diminutive in scale etching inspired a suite of artworks that began with the painting, Referencing Perelle (2008), shown further below. In this painting the intention was to use, in a very loose way, the composition of the Perelles’ print but with a North Queenslander’s eye for colour and the textural “feel” of the local Australian scenery (i.e. the grey tones and sinuous forms of the print were reinvented with earthy colours and spiky features of the Australian bush). This transcription of the 2D print into a 3D sculpture—albeit a flattened bas-relief sculpture—lies at the heart of my interest in pondering how images of scenery can be extended to add extra viewing dimensions. My excitement with this 3D exploration inspired me to consider ways to recreate the Perelle print as if it were both an image inscribed on a flat 2D surface and an image modelled into a 3D form. To find a way forward, I photocopied my sculpture and digitally overlaid the photocopy upon an image of the original print with the idea that the merged image (see below) might function as a model for a drawing. Whether the ink and encaustic drawing shown below that I made from the digital mash-up is a success or not is a question that I am still pondering. 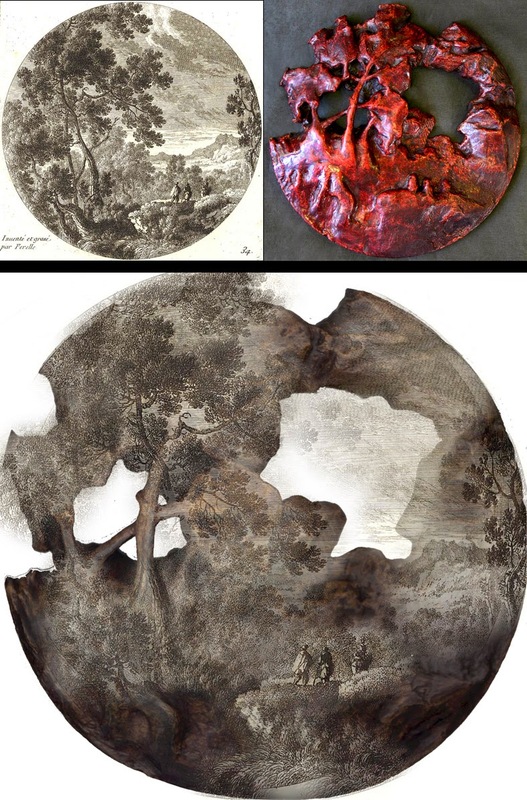 Certainly, I love the idea of working like a palimpsest artist in layering an image with a 2D and 3D history and then wearing back the layers so that only traces of each state remain. In fact, to me, the art of pushing and pulling an image is so intoxicating and rewarding that I really have no desire to claim that an image is ever “finished.” The real point, however, lays not so much with the outcome of my endeavours, but rather with the direction that my ideas took me. In short, the outcome led directly to the topic that I decided to write about: ways to manipulate images featuring scenery to suggest that there is more to be seen than may be actually portrayed. Hopefully this brief account of my current artistic explorations has been of interest. Please remember that your comments are very helpful in guiding the direction of this blog. I found this fascinating. Your explanations on why you find certain images, and the subtle techniques used to create these images - suddenly made sense to me. It was as though the penny dropped! The experimentation with 2D and 3D and the digital manipulation you've been experimenting with - is fascinating. It is wonderful to get inside the artist's mind and glimpse what is actually going on. Thanks LB for letting me know! When I was writing this update I wondered if anyone would find my discussion interesting. I'm so pleased that you took the trouble to let me know. There has been a long break since the last post so your comment has inspired me to start writing again.